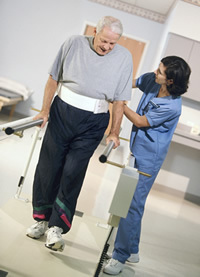 Clatsop Care Health & Rehabilitation has a solid reputation for our intensive skilled rehabilitation program. We offer the same advanced technology and quality staff you would find in larger markets. Our programs include both cognitive and physical therapies, and are tailored to suit each resident's individual goals. We take a collaborative approach to our therapy programs, and include the client's family in developing a therapy plan. All clients are evaluated prior to beginning a course of therapy with us, allowing us to consider multiple factors that have the potential to impact the client's therapy program. including strength and balance assessments, strengthening programs, neurologic and post-surgical rehabilitation, vestibular rehabilitation and wound-care services. including daily living skills, home safety evaluations and modifications, cognitive assessments and wheelchair fittings and modifications. including swallow evaluations and treatments, cognitive training, and therapies to address expressive and receptive language and speech difficulties. We work with short- and long-term residents from all of our communities, as well as clients who see us on an outpatient basis. We work with clients to address issues related to pain management, Parkinson's, mobility, stroke, injury recovery, early Alzheimer's, dementia, amputations and more. We also offer a chronic conditions program to help clients who are living with congestive heart failure or chronic obstructive pulmonary disease (COPD). Our skilled rehabilitation staff includes full-time physical and occupational therapists, as well as certified physical and occupational therapy assistants. We also have a speech therapist on staff. Our skilled rehabilitation professionals are contracted through Consonus Health, ensuring consistent access to these specialized care programs. Please call us to learn more about costs, and for what coverage benefits–including insurance, Medicare and Medicaid–you may be eligible. Clatsop Care Health & Rehabilitation Center is proud to provide our residents with three delicious meals each day from Morrison Community Living. See a sample menu.